Hill was born in Sweden and immigrated to the United States in 1902. After joining the International Workers of the World (IWW) in 1910, he became an organizer, using his talent as a composer of folksongs to help drive recruitment. 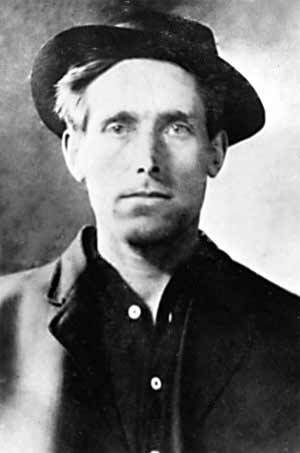 His most famous song, “The Preacher and the Slave,” has the capitalist preacher promising workers that they “will eat, bye and bye / In that glorious land above the sky; / Work and pray, live on hay, /You’ll get pie in the sky when you die.” In 1914, Hill was charged with the robbery-murder of a Salt Lake City grocer and his son. Despite thin circumstantial evidence, he was convicted—undoubtedly because of his radical beliefs. He was executed on November 19, 1915, and was celebrated as a martyr to the American labor movement.